Recent versions of the Android operating system display notifications on the lock screen of the device by default. Some users may like this as it gives them access to notifications on first glance without having to unlock the device first to check out new notifications. The functionality has one serious drawback in my opinion, however. Since notifications are shown on the lock screen, anyone with access to the Android device may see them as well. While that is not a problem when we are talking about new chat messages usually, it may be one if you get two-factor authentication codes or other important information displayed there as well. Even chat messages may be an issue, if you don't want someone else to see messages when they lift up your phone or device. I use PayPal and have configured the service to send me a verification code each time I sign in to the service. 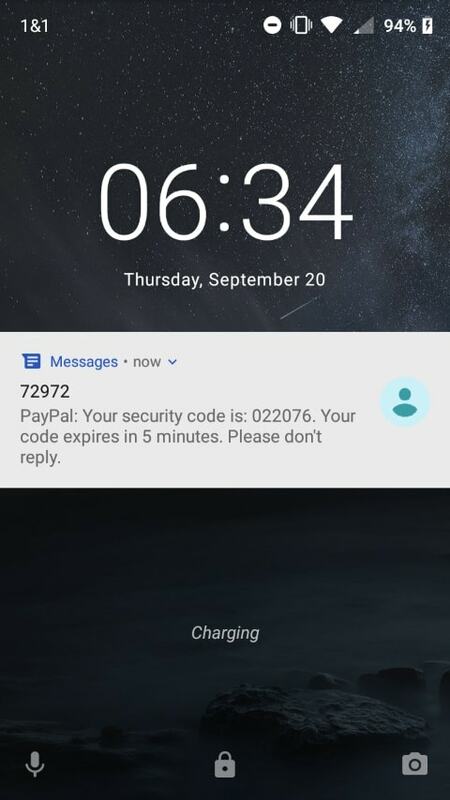 The code is displayed in full on the lock screen of the device and while that speeds up the process of entering it on the PayPal website, anyone else with access to the screen would see it in its entirety as well. 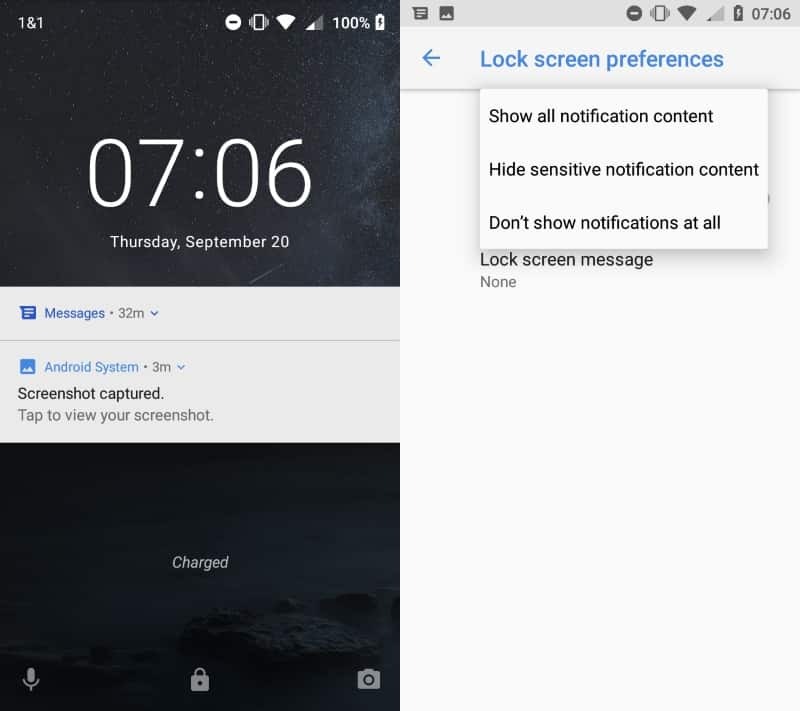 Luckily, there is an option in the settings to turn off lock screen notifications on Android. Please note that how you get there may be different on your device as some manufacturers use different layouts for the Settings on the device. The following applies to a Nokia 5 running Android 8.1 (which is more or less stock Android). Open the Settings on the device. I have to swipe up on the main screen and select Settings from the list of applications on the device. Select Security & Location when the Settings open. Activate Lock screen preferences on the screen. Tap on "On the lock screen". Select either "Hide sensitive notification content" or "Don't show notifications at all". Select the "don't show" option if you don't want any notifications to appear on the lock screen. Sensitive content is hidden on the lock screen but the notifications are still shown. Sensitive content includes new emails and chat messages among other things that are not shown anymore. You get a "contents hidden" or blank content area instead depending on your device so that you still know that new content is available but can't see anymore what it is until you unlock the device and open the notifications. Tip: you can turn off notifications for individual applications installed on the Android device as well. Doing so blocks the application from notifying you. Note that this blocks notifications entirely, not only on the lock screen of the device. 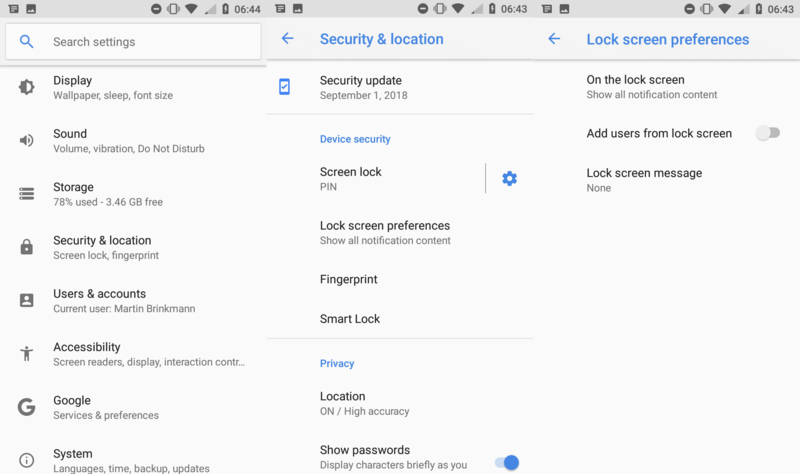 You can long-tap on any notification in newer versions of Android to disable notifications for the selected app, or open the Settings to customize the notification permissions further. Now You: How do you handle notifications on your mobile devices? Don't want notifications on the Android lockscreen? Here is how you turn the functionality off so that notifications are not shown there anymore. I actually choose to do show notifications on lockscreeen, and I’ve been using NILS until I recently bought Redmi Note 5 (xiaomi) and it has a recent Android which doesn’t seem to play “nice” with the nils. If anyone has any suggestions for a different app to show notifications on lockscreeen as well as on desktop with a widget (and no crazy sick permissions issues) I’d be happy to hear. I used NILS for a long time until, like you, the new phone upgrading to new OS broke it. I am now using Notific Pro by Anand Bibek. Try it and see. I had used NILS for a long time until, like you, the new phone and upgrading to new OS broke it. I am now using Notific Pro by Anand Bibek. Try it and see. Good idea. I never considered switching the notifications to hide sensitive content. I just did it. A swipe down on the notification will prompt you to either enter your security code or use fingerprint sensor after which will quickly show you the whole notification centre. So it’s not really slowing things down. Nice! I’ve been intentionally avoiding upgrading my Android stuff, but if I need to for some reason, I’ll be very pleased to be able to disable this. I want nothing on my lock screen aside from a “Reward if found” message with my email address. but can you configure one app to block all notifications when in use?